CEOs must always bring their A-game to every facet of their job and be well accustomed to handling the unexpected if they want their companies to perform at a high level. The demands of the CEO today are greater than ever; beyond the expectations for increased output is the speed at which the CEO has to make decisions, lead the company and rally the team. To increase their capabilities, many CEOs are turning to an entertaining source: improvisational comedy training. Improvisation (or improv, as it’s commonly called) is becoming increasingly accepted as a method to teach business skills; in fact, many of the country’s top business schools are including lessons on improvisation and its use in the world of business, including Columbia, Duke, MIT and UCLA. Many executive development programs and coaches are also increasingly incorporating improv training into the curriculum. Fortunately, you don’t have to go back to business school or join the cast of Saturday Night Live in order to benefit from improv. This article will discuss the core concepts of improv and how they can be taken off stage to improve one’s performance in the business world. Underpinning all of improvisation is the concept of being present in the moment, which is a good notion for life in general; however, its application is more than just trying to obtain a Zen state of mind. In an actual improv performance, if your mind wanders or you begin to anticipate what you’ll say next, you risk missing important details or subtle cues, which will result in the skit going quickly downhill. This can be especially hard for CEOs as there are always multiple issues to contemplate and a myriad of decisions to be made. High-performing executives tend to have the ability to quickly shift focus from task to task while engaging fully in each. As both a consultant and moonlighting improv artist, many of my best moments have come spontaneously due to my ability to focus in the moment. In order to be fully present, whether in a business situation or improv performance, you have to let go of your ego, which demands to control any situation. Just like in a skit, if you’re focused on how you’re going to respond or whether someone will have a better idea than you, you’ll miss what’s actually being said or perhaps, not being said, and you won’t be able to make a meaningful contribution to the discussion. On the other hand, paying close attention to what’s being said while trusting your ability to respond intuitively will facilitate the best thinking of you and those around. This can be especially challenging for CEOs, because they are often accustomed to shaping and dictating discussions, and besides, a strong ego is generally seen as important leadership trait. But, in life and on stage, you need to relinquish the need to control all situations, always be right or come up with the best idea. By letting go, you open the door to your best thinking and leading. My first improvisational teacher used to say, “good improvisational comedy comes when your brain is having hard time keeping up with your mind.” And when it does work it works great. CEOs are regularly put into a position where they have to be quick on their feet, whether it is interviewing with the media, negotiating a big deal, managing their executive team or making important on-the-spot decisions. They also need to tap into their very best knowledge and experience at any given moment. A few years back I was helping a CEO of a large technology firm improve at public speaking. 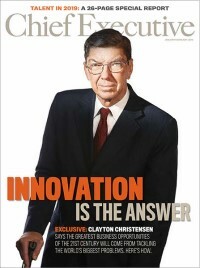 This CEO was incredibly intelligent; however, his inability to think on his feet would often undermine his credibility. When he had to present or unexpectedly interact with company stakeholders, he would too often appear weak and unconvincing. This would manifest itself as mumbling and stumbling in a way that did not exemplify his strengths. After many sessions focused on his presenting skills, we realized we had to try a different tactic to have a real breakthrough. Different improv exercises were introduced to really stretch him and enable him to develop new brain patterns. Science has shown that an individual’s cognitive skills can be improved and new neuro-pathways can be developed, allowing people to think quicker on their feet. It was a bit painful at first as he was asked to do a variety of exercises that seemed awkward to him. These exercises included drills to rapidly develop a story based on the “Yes And” technique (which is discussed in more detail in the following section). Additionally, we spent a lot of time doing drills that required him to retell a personal story, such as one regarding a favorite vacation. After he completed his tale, I would ask him to tell the story again, but instead of being at the Grand Canyon to be somewhere as random as the local post office. These exercises really enabled him to become more mentally agile. He was immediately able to ratchet up his game both in the boardroom and at larger engagements. The “Yes And” concept is the fundamental approach to improv and really exemplifies its spirit. It is a generative way of creating because it constantly adds to the ideas previously presented. On the stage, the players simply build on what the previous person said, in other words “yes to what you just stated and here is more to add to it.” Denying someone is the cardinal sin in this arena. If at any point during a skit someone is denied or their comments are undermined, the skit comes to a screeching halt. I had an experience demonstrating this finding when a CEO of an international retail brand came to me for help due to his frustration with the lack of good ideas for new products. It did not take too long to identify the primary issue, which was the CEO himself. As his marketing people presented their ideas, he would go into mode of harsh critique, immediately pointing out everything wrong with each idea. The marketing team’s energy and excitement was quickly extinguished and consequently, the new product pipeline became anemic, uninspired and unoriginal. The marketing team was no longer willing to take chances in such as critical environment. I worked with the CEO and shared with him the “Yes And” approach. Following some basic training and a change of mindset to focus and build on the positive aspects of ideas, the CEO began anew. Soon his marketing people began responding to the new approach by adding ideas to the previously presented concepts or spontaneously coming up with completely new ideas on the spot. CEOs don’t always realize the extent of how their words can directly impact their organization’s level of innovation, and consequently, its overall success. The first step to integrate the “Yes And” practice is to pay close attention to how you respond to new ideas. If your tendency is to respond with a ‘Yes But’ or to scan for reasons it will not work, you may want to adopt this alternative approach of trying to add something to the idea before knocking it down. Remember, a “Yes But” is simply a denial in disguise and stops the generative conversation. But “Yes And” is not about being nice; it’s about encouraging innovation. One of the most important skills an improv performer has is the ability to tell a story and engage the audience is that story. One method to immediately engage them is to turn the audience into co-creators by having them make suggestions at the beginning of the sketch. Storytelling is just as important to business executives. I once worked with the CEO of a telecom company who was struggling to sell his new vision for the company to its employees and other stakeholders. He was extremely passionate about the vision but this was not being fully communicated to or reflected by his executive team or employees. People should have been extremely excited about this vision but this was not the case. The CEO’s primary mistake was that when he spoke about the vision, he only gave facts and a flat description of the plan. Not only was it uninspiring, it failed to call people to action. In terms of presentations, people rarely remember bullet points or facts, but rather tend to recount stories, emotions and connections to their own lives. The ability of stories to engage and create meaning has been confirmed in numerous studies. According to Mark Turner, a cognitive scientist and linguist, narrative imagining (i.e. a story) is the fundamental instrument of thought and is indispensable to human cognition. In business, stories are an excellent way to unite employees around a common goal and spur people into action. A simple practice that executives can use to enhance their storytelling ability is to pick up a random object and make up the most fantastic story about how and why this object was invented. It does not have to be factual; in fact, the more fanciful, the better, as it will help develop a creativity and vivid storytelling ability. This exercise, along with others that incorporated random elements in the retelling of traditional fairy tales, pushed the CEO to increase his emotional range and his ability to draw people into the story. Other ways to get better at storytelling include using analogies whenever possible and leveraging classic story themes (David versus Goliath is a popular one for businesses, for example). Also, all good stories should have certain elements, such as a protagonist, antagonist, a setting, a plot, a conflict and a resolution. Soon the CEO not only started to tell a better and more emotionally engaging narrative about the vision, but was able to involve his team in the story in such a way that there was a high level of creativity and collaboration. In time, his staff, just like an improv audience, became co-authors of the story and more importantly, co-owners of the vision. A proficiency in improv’s core competencies will benefit you in every aspect of your career. Like any other, these skills can be developed until they eventually become habit. Richard Haier, Ph.D., emeritus professor at the University of California, Irvine, found in his research that the brain is very much malleable and thinking is like weightlifting or running. Although some people may be more naturally athletic, anyone can become faster and stronger by working out. The brain is like a muscle, Haier says: “The more you work it, the more efficient it gets.” Improv, in other words, is an extreme workout to get one’s brain in shape and build its speed. In this fact paced world, improv skills are a must. CEOs who add them to their repertoire are better able to effectively respond and excel in any given situation. Practicing improv is like having a limitless number of dress rehearsals prior to your actual performance on the business stage. Michael Denisoff is the founder and CEO of Denisoff Consulting Group, www.denisoffconsulting.com a management consulting firm headquartered in Los Angeles, as well as a highly sought executive coach and inspirational speaker.